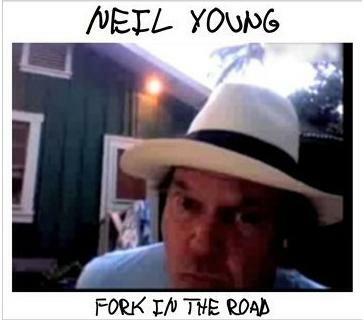 Neil Young News: Neil Young Archives | Letter to the Editor: Mailing-List? Neil Young Archives | Letter to the Editor: Mailing-List? So thanks for the support Vili! A couple of points here -- if we may -- regarding Neil Young News. Now that the Neil Young Archives is running full time with daily updates, we've found our mission here at TW is in question. We've gotten this coming from 2 directions: 1) Is TW just re-hashing NYA T-C? 2) TW needs to be more timely in announcing concert ticket pre-sales. So. Of course we're grateful that folks still visit TW and drop the occasional comment. As Vili says above, TW feeds are active and pinging our subscribers with the most up to date reports. Originally, we set this feature up to generate one notice per day, around 9AM EST. But depending on timing, it might be 24 hours before the feed notification occurs. So we've heard from readers to do real time updates. Well, not to get too off track here, but what do TW readers want these days given the ability to obtain Neil news instantly? TW is a daily check for me!!!! Minimum of twice daily for me! I rely on the daily email from TW! You provide a valued service. I would appreciate an additional email on days when a new show is announced, preferably as close to when the show is announced as feasible. I understand Twitter is real time, but if I had Twitter notifications on, I’d be pinged 50x per day. Email gets my attention as there are far fewer of them than social media posts. Thank you for all that TW does for us. .
Keep it up Thrasher, it's a daily visit for me. This site does something no other site does, it has ALL the NY and related news under one roof. things like side projects, ex and current POTR/Crazy Horse?CSNY articles & essays, and other material which is often interesting to me. Don't you dare go anywhere - please !! Neil's site is full of information but navigating it can be time consuming. It's great for listening to music but this site is much more user friendly which is why we should all try to throw the Thrashers a few bucks every now & then. Like Neil, Thrasher is sponsored by nobody! I'm on your mailing list,Trasher Wheat,and I love to read it.There's always something "inaresting" about Neil,be it old or be it new news.I appreciate Neil Archives-site,but today I had problems with the streaming of it.I wanted to look and listen to it's theatre,but it didn't succeed.It's a pity.Keep sending your messages,thrasher & thrasherette!Cees Mostert. your site is a valuable service for information in all things Neil Young. Its fun and interactive. The news you provide is very timely. I need no other alerts than to check your site once AM once PM. I usually go to NYA once you tell me to by talking about something I may want to see, like buying tickets or live shows or video in the Hearse. Thank You Thrasher. You work well in tandem with NYA. I may not always post a comment, but I do find your page to be a valuable resource, and check it every time you send it out through email or twitter. It's also very easy to navigate back to articles or information I want to re-read. Keep it coming Thrasher! TW is nothing short of constantly being "on the digital rail". It's the place where knowledgeable Neil Young fans meet, exchange their info, views and sometimes (creepy) politcal attitudes from the whole spectrum of what they believe somehow is related to Neil Young and his musical and other output. While NYA is priceless with regards to information, sometimes even straight from the Horse's mouth, it can only cover certain ground (the stage), it cannot replace the audience (the pit, the rail, the GA area) which is another conditio sine qua non of any performance. I'm that guy that's thrilled with the NYA discography, loves watching the live concerts, would love the ticket sales if the guy ever came to my neck of the woods, but am not so thrilled with the rest of the web site. I'll pay Neil for NYA as long as it or I am around, and maybe when the Android app finally releases I'll be happier, but for now I just think it is too little to infrequently. Release more music and add fewer photos Neil. And I don't really give a damn about most of what's there. And I don't really steam the music either. As far as Thrashers Wheat goes, what can you do differently? I appreciate what you tweet and post here even if I've already read it on NYA. new account with a little name change say add NY on the end of Thrashers Wheat .... FB its nice to be able to repost cool things to friends who are part time Neil fans, Also much simpler to add stuff we might have. Thanks so much for your support and suggestions. It means so much to mean so much to our readers. From time to time wee get a little jolt that makes everything we do here @ TW worthwhile. So nice to hear that even with NYA cranking it out, we're still able to provide the value add. So we'll consider more closely communication options and coverage tweaks. Hopefully get something going before the next concert runs and tour ticket announcements. As always, drop us a line anytime. Illustrative of the situation, I would never have seen this NYA post had Thrasher & Thrasherette not posted it here. As much as I want to support Neil and the archives project, there are just way too many websites in the world to check. And so, I go to none of them, but ask them to come to me. When it comes to Neil Young news, Thrasher's RSS feeds have served me for, what, close to twenty years now? Thank you, guys. Without this website, Neil wouldn't be such a daily part of my life. It is also important that the fan base has an independent outlet for news and discussion. 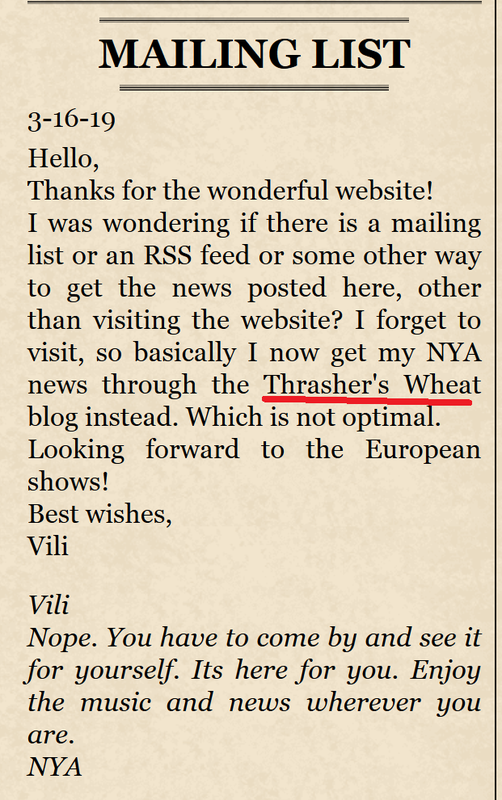 While Thrasher's Wheat itself may not engage in much criticism of Neil's doings, the commenters here have shown to be more than capable of taking care of that aspect, both constructively and in terms of just letting off steam. I have been a lurker for two decades but enjoy reading the discussions. Thank you, everyone. @ vili - well, as you say -- quoting TW and re-quoting you -- this is amusing indeed. So amusing in fact, that we must make this the TW Comment of the Moment right NOW! I usually come by TW about 2 to 3 times a week, depending on if its a busy Neil Season or not...although some weeks I check it a little less. I do usually see NYA updates here 1st because I visit the NYA less frequently. Although I'm seeing this post 6 days late =) so I guess I haven't been by since last week.